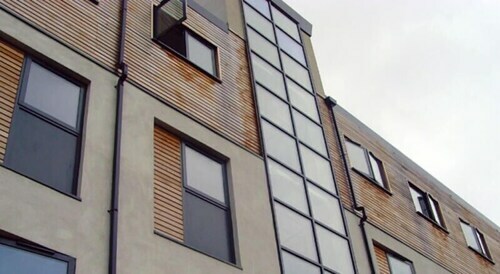 Situated in Leeds, this apartment building is within a 15-minute walk of University of Leeds and Leeds General Infirmary. O2 Academy Leeds and Leeds Grand Theatre are also within 1 mi (2 km). Burley Park Station is 21 minutes by foot and Leeds Station is 22 minutes. 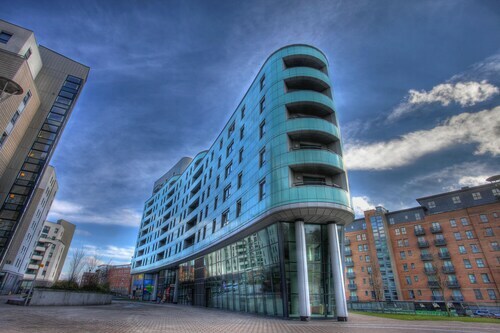 Located in Leeds City Center, this apartment building is within a 10-minute walk of Canal Wharf and Leeds Grand Theatre. 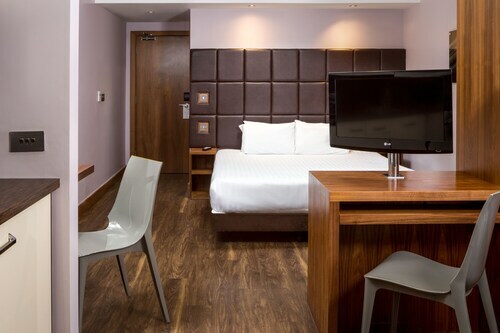 Royal Armouries and O2 Academy Leeds are also within 15 minutes. Leeds Station is only a 5-minute walk. 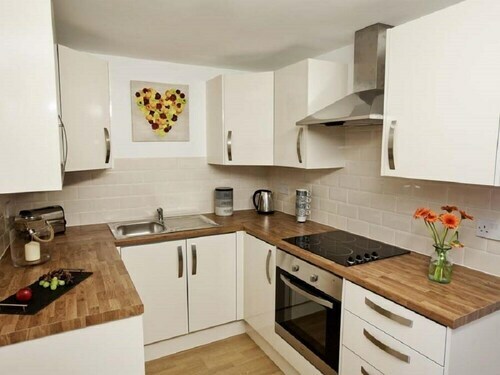 This family-friendly Leeds apartment building is located in the historical district, within a 10-minute walk of Leeds City Square, Leeds General Infirmary, and O2 Academy Leeds. First Direct Arena and Leeds Grand Theatre are also within 15 minutes. Leeds Station is only a 3-minute walk. 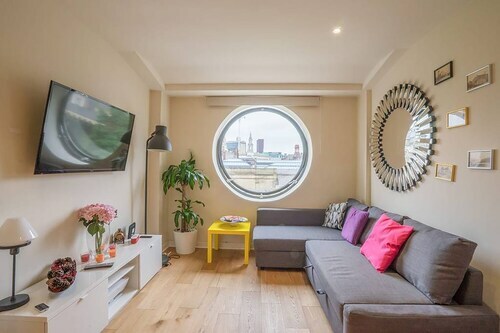 Located in the heart of Leeds, this apartment building is within a 15-minute walk of Leeds Dock, Royal Armouries, and Leeds Grand Theatre. First Direct Arena and O2 Academy Leeds are also within 1 mi (2 km). Leeds Station is 14 minutes by foot. Situated in Bradford, this apartment building is within a 10-minute walk of Bradford Cathedral and Wool Exchange. Alhambra Theatre and Colour Museum are also within 15 minutes. Bradford Forster Square Station is only a 3-minute walk and Bradford Interchange Station is 12 minutes. 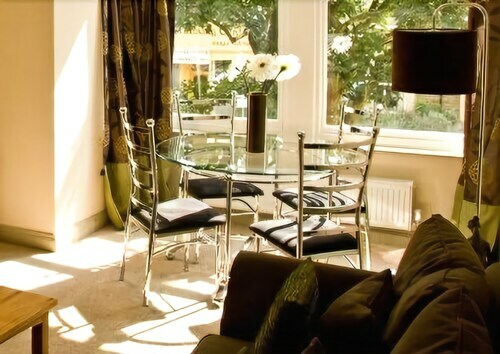 Situated in Harrogate, this apartment building is within a 15-minute walk of Valley Gardens and Harrogate Convention Centre. Royal Pump Room Museum and Mercer Art Gallery are also within 10 minutes. Harrogate Station is 15 minutes by foot and Hornbeam Park Station is 29 minutes. Situated in Bradford, this apartment building is within a 15-minute walk of Colour Museum, Alhambra Theatre, and Wool Exchange. University of Bradford and National Science and Media Museum are also within 15 minutes. Bradford Interchange Station is 15 minutes by foot and Bradford Forster Square Station is 19 minutes. 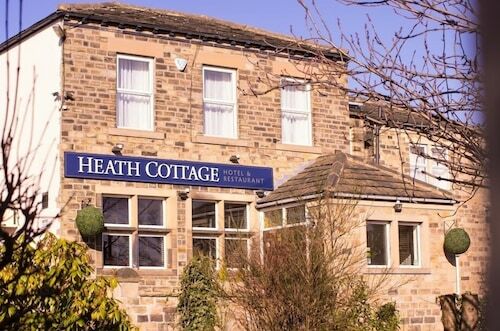 Situated in Bradford, this apartment building is within a 10-minute walk of University of Bradford, Alhambra Theatre, and National Science and Media Museum. Colour Museum and Wool Exchange are also within 15 minutes. Bradford Interchange Station is 13 minutes by foot and Bradford Forster Square Station is 19 minutes. 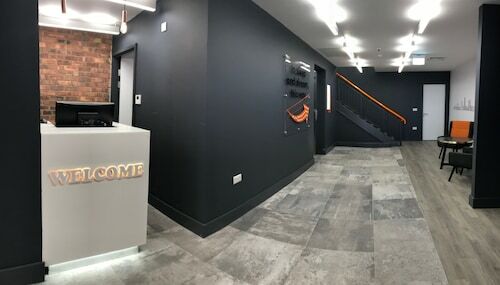 Located in Leeds City Center, this apartment building is within a 5-minute walk of Leeds City Art Gallery, Leeds General Infirmary, and O2 Academy Leeds. First Direct Arena and University of Leeds are also within 15 minutes. Leeds Station is 7 minutes by foot. 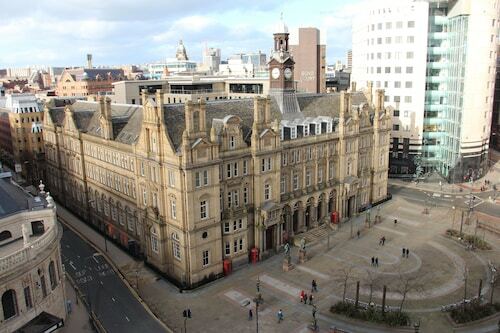 Situated in Bradford, this apartment building is within a 10-minute walk of Colour Museum, Alhambra Theatre, and Wool Exchange. National Science and Media Museum and University of Bradford are also within 10 minutes. Bradford Interchange Station is 11 minutes by foot and Bradford Forster Square Station is 15 minutes. 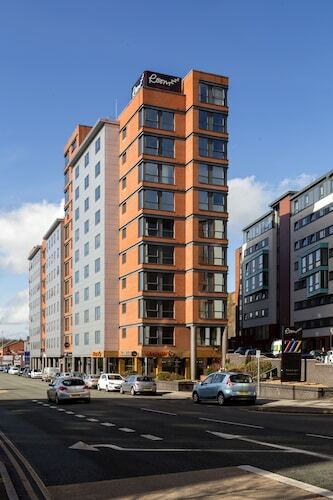 Situated in Leeds, this apartment building is within 1 mi (2 km) of Leeds Dock and Royal Armouries. First Direct Arena and Leeds Grand Theatre are also within 2 mi (3 km). 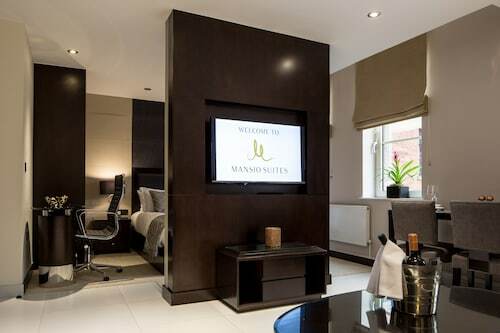 Located in Leeds City Center, this luxury apartment building is within a 5-minute walk of Leeds City Art Gallery and O2 Academy Leeds. First Direct Arena and Leeds Grand Theatre are also within 10 minutes. Leeds Station is 7 minutes by foot. Hotels are a great option for a quick flyby, but a wise wanderer wants deeper insight into a new place. Booking an apartment is your opportunity to really taste the flavor of Dewsbury and become a temporary resident. We can help you secure the cozy or luxury apartment you want to make your adventure as chic or comfy as you desire. With an apartment, you feel right at home—even in the heart of a new city. Choose an apartment with a full kitchen or kitchenette so you can whip up a scrumptious breakfast in the morning, or pack a lunch before beginning your adventure for the day. Would you rather stay in with your someone special? Enjoy the privacy your apartment offers as you sip wine and settle in for a well-deserved evening on the couch. Travelocity offers apartments throughout Dewsbury, including luxury apartments where you can gaze out at the sweeping views of local landmarks from a grand balcony. Would you rather spend your vacation funds on amazing concerts or that gastropub right on the corner? Then opt for one of our cheap apartments near the best destinations to stretch your dollar as far as it will go. Choose from many different apartments for the one that best suits your travel style. Studio apartments are an excellent choice for lone wolf or business travelers who need a snug den to relax in between outings. Planning on bringing the whole family? 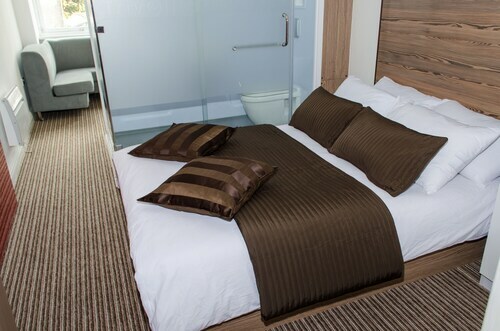 Serviced apartments mean cleaned sheets and vacuumed floors, so you can feel at home without having to actually perform the domestic drudgery during your time off. If you want to eat, breathe, and live like a local in Dewsbury, then there’s really only one choice. 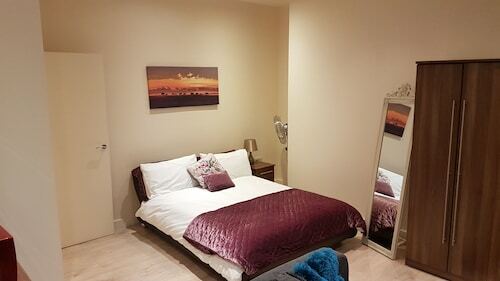 Check out our many apartment options throughout Dewsbury. Your perfect retreat is calling your name!